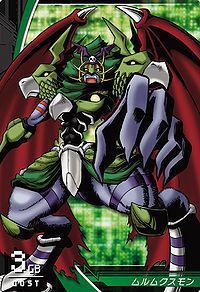 Although it was originally a high-ranking Angel Digimon, it fell from grace and became a Demon Lord Digimon. It is in the ruling class of the Nightmare Soldiers, with the title of "Count", and it manages thirty legions of demons. Also, it is attended by the Mythical Beast Digimon Griffomon, which it uses as its own hands and feet. Its Special Move is spewing hellfire, which is said to inflict eternal suffering even in death (Gehenna Flame). A corruption of Murmux, a count from hell. Anime/Manga Digimon Frontier: Revival of the Ancient Digimon!! 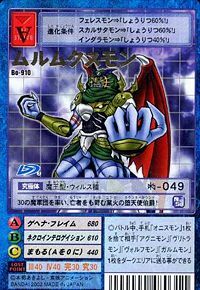 3.1.1 Digimon Frontier: Revival of the Ancient Digimon!! Gehenna Flame  ゲヘナ・フレイム Gehena Fureimu Spits hellfire from its mouth to inflict death and eternal suffering. Alternately, conjures up a gigantic sphere of flame many times its own size. Necro Interrogation  ネクロインテロゲイション Nekuro Interogeishon Throw a deadly sphere to inflict great damage. 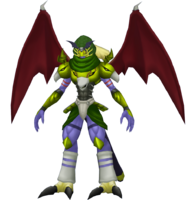 Murmukusmon was an evil Digimon that came onto the Wandering Island. 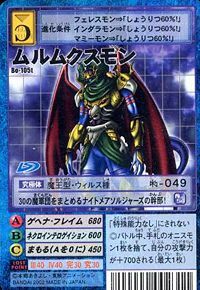 He saw that Ornismon had been sealed there and in the forms of Darcmon and Hippogriffomon he contined a war between human and beast type Digimon so that he could use their energy to revive Ornismon. 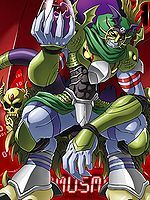 His plan is a partial success, but the chosen children helped revive the Ancient Warriors and destroyed Murmukusmon giving the ancient warriors no obstacle to destroy Ornismon once more. 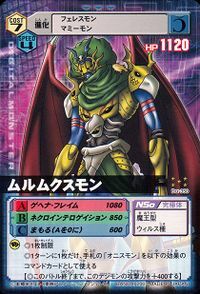 Murmukusmon is one of Barbamon's generals, the Commandments. He was once a Holy Angemon, and came to care for an Art digimon, Chibimon. Unfortunately, Chibimon becomes sick, telling Holy Angemon that an Art digimon needs a Tamer's love as nurishment to survive. Chibimon gives him a small brooch as a gift before dying. At this point, Holy Angemon swears not to let anything like Chibimon's death due to his mistreatment by his Tamer happen again. Can be evolved from Skull Satamon at Level 41 with 8 Evoluters. 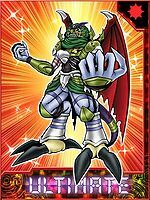 Murmukusmon can only be obtained as a collectible card. 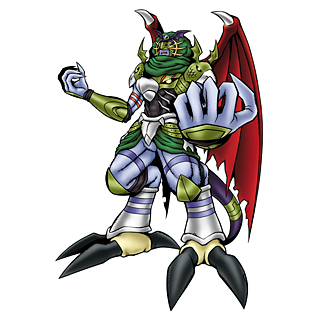 Murmukusmon is available as a Digimon Medal. This fallen angel count of dead-tormenting hellfire leads a demon army of 30! A leader of the Nightmare Soldiers who has put together a demon army of 30! A former high-ranking Angel that fell from heaven and turned into a Demon Lord. It holds the title of count and commands 30 legions of demons. It is capable of disguising itself as other Digimon to sow the seeds of conflict. ↑ 6.0 6.1 Revival of the Ancient Digimon!! ↑ Digimon Next: "Paired Sacred Devices - Digimon Twin!" This page was last modified on 2 March 2019, at 20:44.